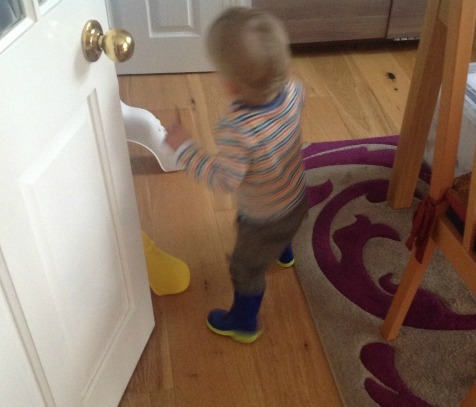 Bear has grown out of his first pair of shoes and mummy and daddy can't get to the shops until the weekend so Bear was stuck indoors with slippers. Bear likes to go out. 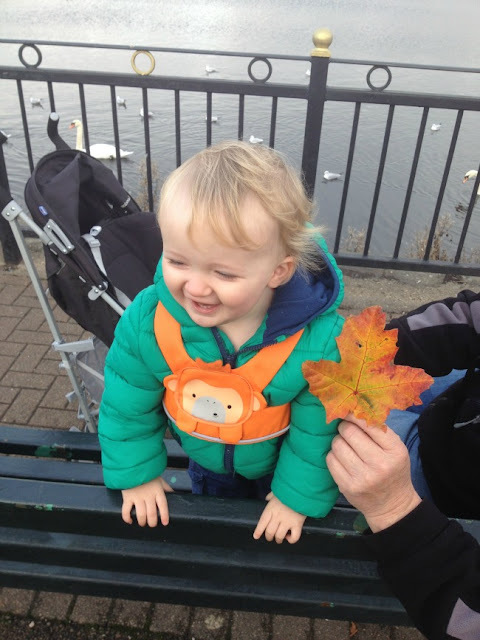 He loves the park so on Monday we went to our nearest supermarket (Asda) to buy wellies. Bear was really lucky, only one pair left in size 4, lots and lots in size 5 and bigger. Bear was happy though, he loved them. 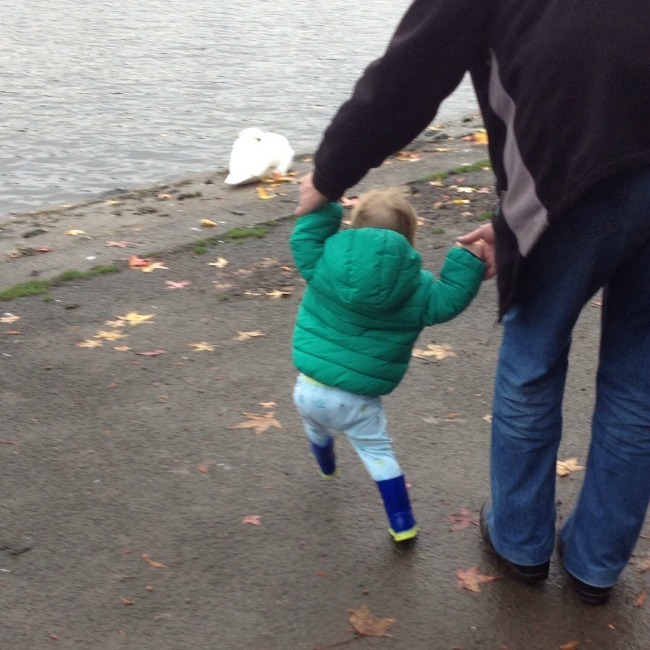 Wellies were meant to be a stop gap, just something to keep his feet dry and let him walk in the park while he waited for new shoes. Bear wasn't told this. He thinks they are the best thing ever. He wants them on all the time. He picks them up and points to the door. He chews them (uggh!). He shouts into them. He puts toys in them. He loves them. Wonderful Wellies. Then on Tuesday we had to go to the doctors for his horrible jabs. This meant bringing all his meals and naps forward a little and his mummy taking time off from work. He must have known we were going somewhere because in the afternoon he took his nap early and slept.....and slept.....and slept! Oh No! Why today now we have to wake him up! So we were just a little later getting to the surgery than we would have liked. Mummy wanted to see the health visitor too but after waiting ages the queue didn't go down so we gave up and went to see the nurse for our appointment for his jabs. She was running late and we waited another half an hour! We should have waited for the HV, if only we had known. Eventually we were called, oh my heart sank. I know it's important but we spend our whole lives protecting him from nasty things and pain and here we were taking him to be hurt by not just one but 3 sharp needles. "You know why you're here today he's having 3 injections nmmcocl mmr mmmhib booster. He may get mghm, spots, mxptm, grumpy, mghjm. 7- 10 days, tonight"
It sounded something like that. "mmfght hmpht" she replied as she huffed and puffed trying to get a piece of paper out of the printer to write on. Don't they have this in a leaflet nowadays? * Why not I wonder? She then asked us to move to another part of the room and for mummy to sit on the chair with Bear. "There was a chair there" she said looking straight at me "but you moved it!" "Yes I did" I smiled as I put my chair back. Nurse held Bears legs, mummy held his arms. I stood impotent and useless. One injection, fast but painless. Second....screams. Next leg one injection more screams, cuddles from mummy. "You must wait 10 minutes before you leave" nurse said as we went out the door feeling shell shocked. She didn't explain why. Grandad was waiting for us, he took Bear and distracted him by looking out the window at cars. Well done Grandad. 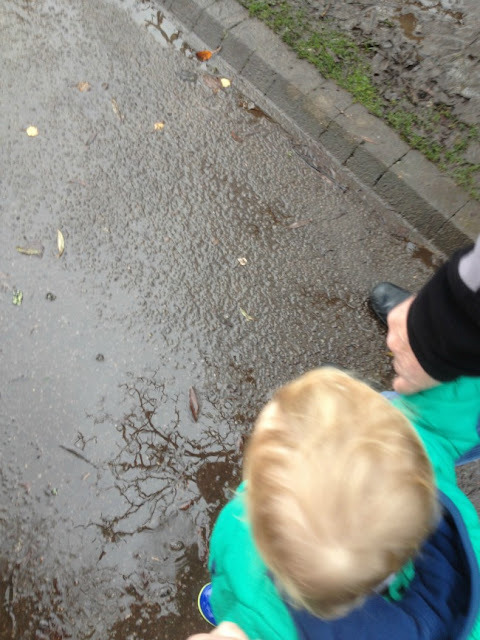 Mummy then took Bear to put his trousers and wellies on, Bear wasn't happy with that and screamed again. Only Grandad was allowed to do it. 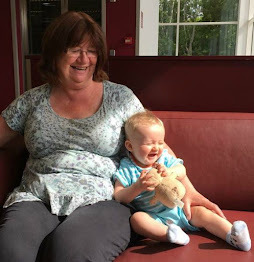 So a small piece of advice (wish we'd thought of it before) If you are taking someone to support you when your little one has their jabs, let them be the one to hold them. As soon as the jabs are done, hand over to the mummy/daddy. That way you are Mr Nasty. No more horrible jabs until Bear is 3 years and 4 months! Oh and he still loves his wonderful wellies. * Information about all the vaccinations is available on the NHS website. It lists all side effects too. yeah it's quite heartbreaking. i think he'd sleep in his wellies if we let him. They are cool wellies. I love the colour - a great blue. We were lucky the last pair were blue or he'd had to have pink Frozen ones! Yeah I think all kids love wellies, they are allowed to splash in water! Wellies are awesome. My girl seems to believe if she puts her wellies on she can make it rain. The jabs are awful, aren't they? I have done all of them up until age 2. From now on Daddy takes them. 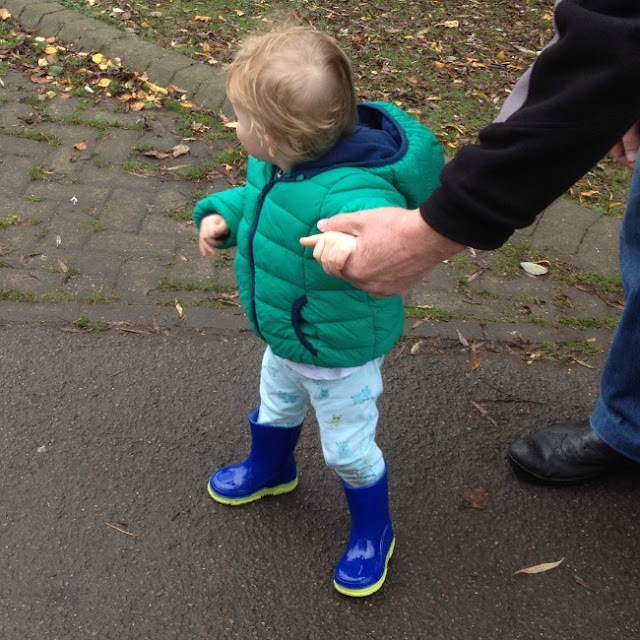 I love his wellies, my son has some new minions ones and he would wear them for bed if he could! Ah taking them for their jabs is awful - I am glad we have a while to wait until our next set of jabs too - thankfully. Like that last piece of advise, good idea.Well done Granddad on the distracting. When I have my flu jab I am told 10 mins in case you take a reaction to it and then you are still in the right place to receive some medical assistance. Think this may have something to do with the 2 epipiens I carry. Have known my son and my grandson to go to bed in new wellies cos they would not take them off. I always hate taking them for jabs but hubby refuses so it is nasty mummy. Love his wellies! What a horrible nurse. No bedside manner and especially with a little one. Hope someone jabs her!! 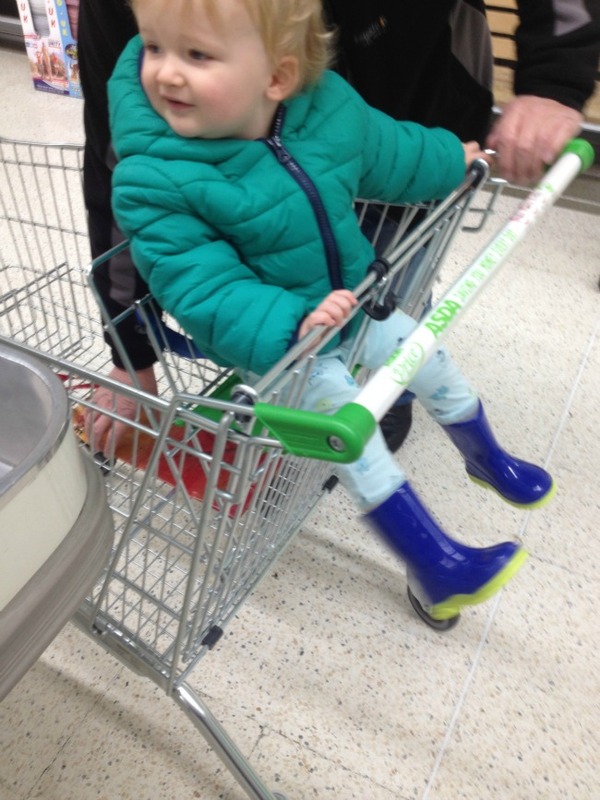 He's happy with his wellies though.. good old Asda!